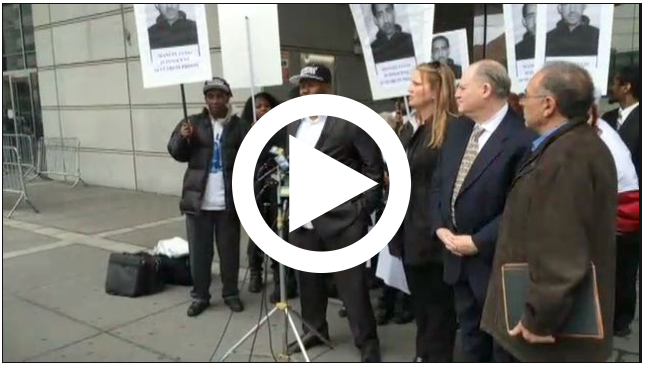 Several years ago, we held a rally in front of the Bronx Supreme Court House. We distributed flyers. You left a voice mail that stated you worked at the court house and was a witness to the crime. You never left contact info. Our attorney at the time, didn’t think it was necessary to get a statement from you, as this case is clearly black and white. However, we would like you to speak to our current attorney. Please inbox your contact info. All will be confidential. Carlos Ventura (a drug dealer) and Manuel Lugo met on the same night that Ventura was murdered. They had a brief arguement over misinformation given to Ventura about Lugo (that Lugo was moving in on Venturas territory). Lugo corrected the misinformation, they shook hands and went their separate ways. About 10 minutes later, shots rang out from the area Lugo had just left. He walked back up the street to find that Ventura and his pregnant girlfriend had been shot to death. Miraculously, the baby was born alive. Lugo and Roman were tried in April of 1994, by seperate juries. 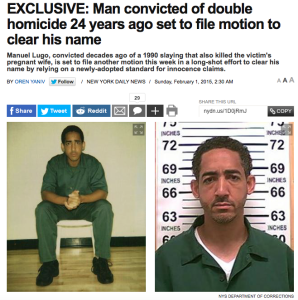 During Lugos trial Angel Otero, the prosecutions only “eyewitness” to the shooting, testified that after the arguement between Lugo and Ventura, Lugo instructed Roman to kill Ventura but to be careful of his pregnant girlfriend(Marilyn Colon). That he (Otero) then witnessed Roman pull out an Uzi from his coat and shoot Ventura and Colon. His step-son, Julio Santos, testified that he heard the arguement between Lugo and Ventura but did not witness the shooting. Ramona Garcia, the defenses only eyewitness, testified that on the night of the shooting, she was on Vyse Avenue and observed a car arrive. That she saw 2 people get out of that car and then heard several gunshots. She testified that these people were not Roman and Lugo. Information revealed in a book by Professor Robert Jackall, published in 1997, states-Ulysses “Chino” Mena alleged that Lugo was opening a drug spot on Vyse Avenue for Sepulveda (Lenny). That Lugo was having problems with Ventura and turned to Sepulveda to persuade Ventura. That Sepulveda, Mena and some other guys waited on Vyse until Lugo signaled that Ventura had arrived. Then Sepulveda asked “who is going to do it?” Mena said he would and ran over to Venturas car where he shot Ventura and Colon. In a sworn affadavit to Race on November 6th 2003, Julio Santos (Oteros step-son), also recanted his trial testimony stating that his step father told him to lie for reasons unknown to him. In addition, Vivian Otero, Angels Oteros wife at the time, gave Race an affadavit on Sept. 27., 2003.stating that about a month after Lugos arrest, she was interviewed by Dawn Florio and that she informed Florio that she was in her bedroom when the shots rang out. That she left her room to check on her children (Julio and his sister) and that they were both in bed and Angel Otero was in the living room. (Probably why Vivian was never called to testify because it would have blown Florios case out of the water) (It is worth noting that Dawn Florio was on her way to a judgeship at that time and was willing to do anything to win this conviction) Vivians 2003 affadavit supports Angel Otero and Julio Santos’s recantations. Based on the above information, which was known to Florio at the time of the trial, but not to Lugos defense, it is clear that the verdict of conviction against Lugo was obtained based on false testimony. Clearly, Angel Otero, the prosecutions only “eyewitness” never heard Lugo instruct Roman to kill Ventura and was apparently not even a witness to the shooting. It is evident that in this case the police conducted a botched investigation and that Sepulveda and Mena (two informants) while under promises of lenient sentences, could have been led to implicate Lugo in the crime to cover Florios wrongful conviction of lugo. (Afterall, the DA’s office will not turn over their original confessions. Probably because they don’t mention Lugo and would only help exonerate him.) Florio allowed Angel Otero to falsely testify at trial. Despite his admission to the murders of Ventura and Colon, Mena has never been charged. Lugo maintains that he doesn’t know who killed Ventura and Colon. That if Sepulveda ordered Mena to kill Ventura as records show , only they know why they did it. Sepulveda is the self admitted leader of one of the most vicious drug gangs this state has ever seen. Unlike Lugos admission, Roman, Mena and Sepulveda admissions, only demonstrate that apparently Roman was a witness to the crime and that Sepulveda and Mena were participants in the crime. Confronted with totally different stories of what happened that night ( Sepulveda and Menas stories versus Oteros versus Romans) and with Vivian Oteros exculpatory statement, Florio acted as prosecutor, defense counsel, judge and jury by going ahead with Angel Oteros lies. Florio had an obligation as an assistant DA to present all the evidence for the jury to evaluate before reaching it’s decision. 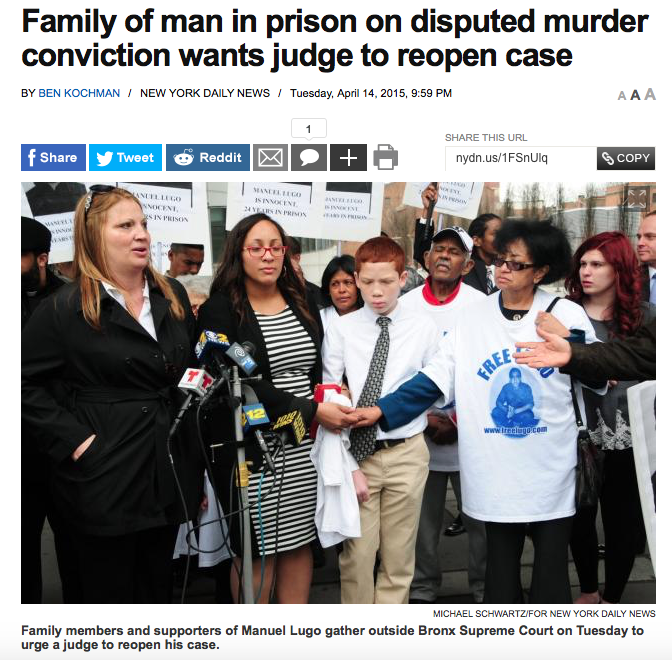 By withholding crucial evidence, Florio has deprived Lugo of a fair trial. “Chino” (Ulysses Mena) also confessed to the double murder, but the bureaucratic vagaries of the criminal justice system thwarted fixing his guilt legally. Manuel Lugo aka Supra worked for Lenny (Lenin Sepulveda) opening a spot on 2183 Vyse Avenue at 181 Street in the Fourth-Eight precinct; Wilfredo Roman worked for Supra. Carlos Ventura the already established big man on the block, refused to stop selling his own brand of crack out of the same building. So Supra turned to Lenny for help in persuading Ventura. On December 30, 1990, Lenny took Rob Base, Lace and Dominican Chino up to Vyse Avenue where they waited until Supra signaled to them that Ventura had arrived on the block in his car. Lenny asked his boys: “who’s gonna do it?” and Dominican Chino (Ulysses Mena) said: “I will.” Chino ran over to Ventura’s car and shot Ventura in the head. But also in the car was Marilyn Colon, Ventura’s girlfriend, seven months pregnant, terrified and wide-eyed. So Chino shot her too. Supra and Roman were tried for the murders in the Bronx. Supra was convicted, Roman was acquitted. Then Chino, in a fit of remorse, poured out his story to Mark Tebbens, Dan Brownell, and Don Hill, and even agreed to a 20-years-to-life plea to the murders. As part of his own plea agreement, Lenny admitted his role in the murders and named Chino as the shooter. But when the investigators contacted the Bronx District Attorney’s Office and the Four-Eight detective squad with the news, they received chilly receptions. Were the boys from Manhattan once again trying to outshine the Bronx by unmaking a made case? (Emphasis added). PAGE: 230-231 of the book “The Wild Cowboys” AUTHORED BY PROFESSOR ROBERT JACKALL. Bronx Assistant District Attorney Dawn Florio fired, for providing a false alibi for her ex-boyfriend. Bronx Assistant District Attorney Dawn Florio, niece of Appellate Division Second Department Justice Anita Florio, has been fired, for providing a false alibi for her ex-boyfriend Peter Soto. Soto’s accused of “dumping” his current girlfriend by the side of the road in Orange County, and then burglarizing her Bronx apartment. Florio initially claimed to be with Soto at the time, but later recanted. She’s been fired, but no charges have yet been filed. The Soto case has been transferred to the Queens District Attorney’s office, to avoid a conflict of interest. The book by Professor Robert Jackall “The Wild Cowboys” was originally published in 1997. He updated the book October of 2005. He has become a co-conspirator with those keeping Manuel Lugo in prison. In his updated version, he states that Manuel Lugo admitted to setting up these murders and that the wrong witnesses are why he’s in jail. If this was the case, there would be no Lugo Support Committee. Mr. Lugo had nothing to do with ordering these murders (as charged) or setting up these murders as Jackall states in his book. We challenge Mr. Jackall, the Bronx DA and/or detectives to bring forward this so called “admission.” Mr. Jackalls timing (book update) and his words are an obvious attempt by those with power to sway Manuel Lugos supporters. Not to mention that book was updated while Mr. Lugo had motions pending in court. They throw one road block after another. What does that tell us? When Manuel Lugo was convicted, Carlos Ventura and Marilyn Colons family were convinced justice was done. These families trusted the evidence at trial, as presented by the prosecuting attorney, Dawn Florio. What these families did not know then, was that the case on trial against Manuel Lugo and Wilfredo Roman was a complete fabrication. What these families did not know then was that they were being lied to by the prosecuting attorney. These families were unaware of the fact that Roman did not kill Ventura and Colon under orders from Manuel lugo as the prosecution alleged during trial. These families did not know then that lugo did not give anyone orders for Ventura to be killed. When Lugo was convicted, these families thought that justice was served. Little did they know then, Ulysses “Chino” Mena, the person who confessed to killing Ventura and Colon (as records show) was given a free pass by the prosecution. Lenin “Lenny” Sepulveda and Mena (as records show) were informants at the time that they rendered their admissions. These families did not see justice materialize as they would have had, had the culprits responsible for the murders of Ventura and Colon been brought to justice. These families were lied to and should demand that the case be reopened and that the individuals responsible for the death of Ventura and Colon be brought to justice. The Ventura and Colon families should demand an explanation as to the reason why Mena, the confessed shooter, was never prosecuted (as records show) and will soon be released back into the same community where he admitted to viciously murdering Ventura and Colon. Mena is scheduled to appear before the parole board any given day. In demanding justice, the Ventura and Colon families will get the satisfaction of bringing those who are really responsible for the deaths of their loved ones to face the punishment that they deserve. It will also enable Lugo to have a legitimate chance to demonstrate his innocence before a jury that will be privy to the truth and not just what the prosecution wants them to hear. Lugo is innocent and the evidence in this case clearly demonstrates that Lugo was railroaded from the very start of the prosecution against him. Unless Manuel Lugo is given the fair trial that he has been denied, a fair trial where the truth will be brought to light, those responsible will never be held accountable for the deaths of Colon and Ventura. It is extremely sad that Ventura and Colon, two innocent human beings, lost their lives for no reason whatsoever and that the person who killed them got a slap on the wrist by the prosecution and has not been brought to justice. It is also extremely sad that Lugo is incarcerated for a crime that he did not commit. The District Attorneys Office will try convincing the Ventura and Colon families that justice was served by convicting Lugo. Sepulveda still says that he ordered the murders at Lugos behest. But whatever happened to the well tailored story presented at trial which Angel Otero fabricated and the prosecution did not correct? Wasn’t Otero telling the truth, according to the prosecution, when he testified that he heard Lugo order Roman to kill Ventura? Why should we now believe Sepulveda when he alleges that he ordered Mena to kill Ventura at Lugos behest? We not only want justice for Manuel Lugo who we know is innocent, we also want justice for the victims and their families. Hello, and welcome to FreeLugo.com. We appreciate you taking the time to visit our site. Feel free to join the discussion by leaving comments, and stay updated by subscribing to the RSS feed. Bronx ADA Dawn Florio Fired!